With Christmas just around the corner I've realised how few weeks I have left to start making all those gifts I had planned. I love making personalised presents for the people I love, but I am fast running out of time. I need quick, easy and fun ideas to get me started. That's why I made this playful mini-album. It only took a couple of hours but it's that perfect little something to pop under the tree for my husband. Have a go at making these for your friends and family. They are suited to any theme and are so easy to make. 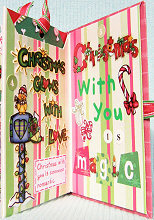 This mini album was created with Paper Patch Red Plaid paper, Doodlebug Christmas Stripe paper, Paper Pizzazz Christmas Candy paper, Paper Pizzazz Christmas Words paper, red cardstock, white cardstock, green cardstock, green ink, a red pen, Christmas ribbon, a selection of Alphabet stickers, Doodlebug Designs Cheerfully Christmas Icons stickers, Bo Bunny Classic Christmas Alphabet stickers and Heartwarming Christmas Joy stickers. To create the basis of your mini album, cut a piece of red cardstock measuring 8 1/2 inches by 11 inches. Follow the instructions here until you have folded it into a book. 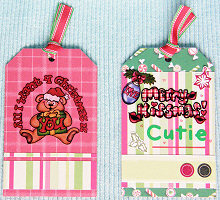 Before you start decorating, decide whether or not you are going to hide any tags within the pages of your album. If so, select which pages you want to hide them in and cut a whole in the top of those pages, as shown here. This will allow your tag to easily slide in and out. I have chosen to hide tags on page #1 and #5. Now it is time to start decorating your pages. Do not decorate the front and back covers. These will be covered up later on. How you decorate your pages is completely up to you. You can include photos if you like, or you can simply tell a story using stickers and your own notes. I have made my album playful and fun while still expressing how much I loved spending Christmas with my husband. Now that your pages are decorated, set them aside. It's time to make your front and back covers. Cut two pieces of cardstock measuring approximately 3 inches by 4 1/2 inches. You may wish to adjust these measurements slightly. Just make sure the size is slightly larger than the front of your book. Cover one side of each cover with a patterned paper (I have used a red plaid design). Lay one cover in front of you with the front face down. Attach a piece of ribbon horizontally half way up the right side. Only about 1cm of the ribbon needs to be attached. The rest should hang out the side. This is the ribbon you will use to tie your book closed so make sure it is long enough. Repeat this step for the other cover, only this time, place the ribbon on the left side. 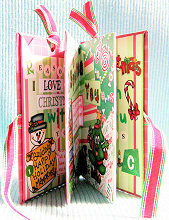 Now that your ribbon has been attached, glue the covers to the front and back pages of your book. Make sure you use a strong adhesive - you don't want it to fall apart later. I recommend letting it sit for awhile with a rubber band around it just to make sure the adhesive sticks properly. If you decided to include tags in your mini album, now is a good time to make them. I made mine from left over red cardstock and scraps of paper. I also used several left over Christmas stickers to decorate them. Once they are dry, slip them into the space your made for them in your mini album. Finally, tie your ribbon. Your mini album is now complete and you are ready to give it to your someone special.